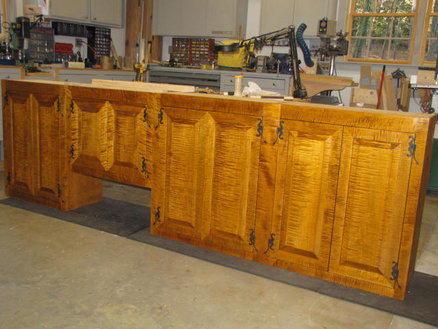 Today’s #FollowFriday is Roger Moore from Aiken, SC, whose shop we featured in our August 2013 issue of Wood News. Roger is a retired nuclear engineer who left engineering in 2003 and built an entirely new two-story workshop right after retirement. He put a lot of thought and detail into the structure and specifications of his shop, which you can read more about in his feature HERE. 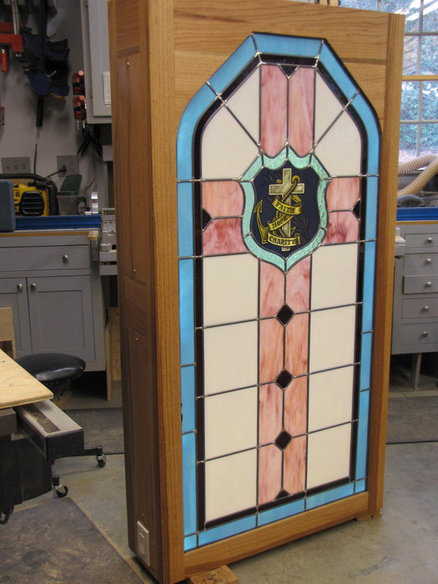 Within his shop, Roger has created a variety of pieces and mostly focuses on building custom furniture, book cases, yard furniture, and cabinets. Kitchen Cabinets made of curly maple. 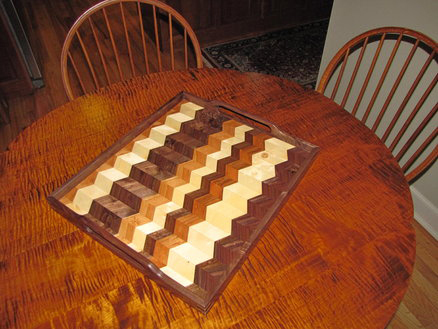 Chess Board made with Walnut and Maple with splined joints. Dovetailed box for chess and checker pieces made of Cherry. 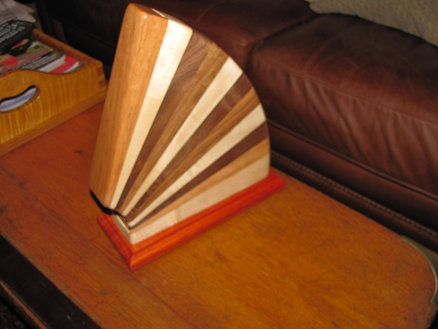 Knife Block of maple, walnut and cherry on a padauk base. 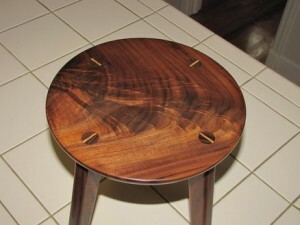 Grandsons stool made from crotch of a black walnut tree. Round mortise and tenon legs with maple wedges. Finish is Minwax Golden Oak Stain, followed by dilute shellac sealer, diluted polyurethane, rubbed out with 0000 steel wool and finishing wax. 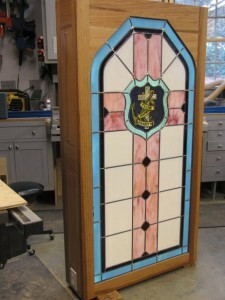 This piece was done in red oak with strip LED backlighting. 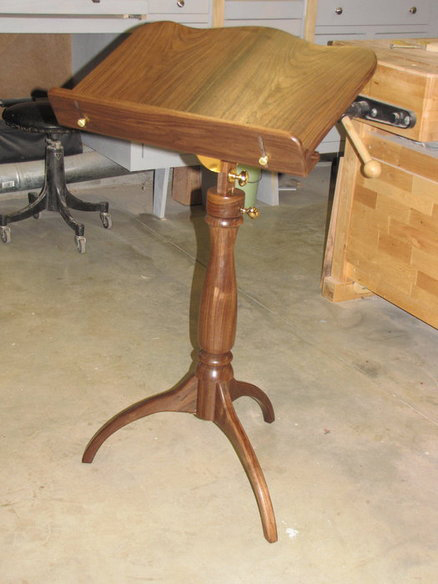 It was done for a women’s cancer charity in Augusta, GA.
One of Roger’s more in depth projects has been his work with music stands, specifically the one below that he made for as a graduation gift for a student going to Graduate School. The stand is made of black walnut with brass hardware. The pedestal is made of a black walnut gunstock blank obtained from the Conasaga River Lumber Mill in the early 1970’s. The remainder of the wood in this stand came from a black walnut log cut in Aiken, South Carolina that was cut 4 years ago. It was dried in the wood racks in my shop for over 3 years before it was made into the conductor stand. 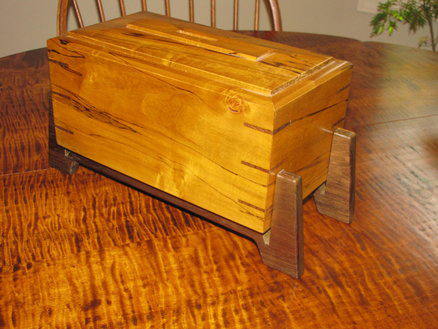 The platform is constructed of two pieces of book matched black walnut and incorporates an adjustable lip to best suit preferences for turning pages, etc. It is affixed to the platform using a bread board joint to hold the platform flat and allow for expansion and contraction. It also incorporates a small nook on the underside of the platform to hold a baton. To see more of Roger’s work, visit his Lumberjocks website HERE. About 28 minutes ago from Highland Woodworking's Twitter via Hootsuite Inc.